Karen and Suzanne work on a craft project during an April 21 gathering at Divine Providence Village. Members of St. Jude Parish in Chalfont visited the village for a day of service and fellowship. 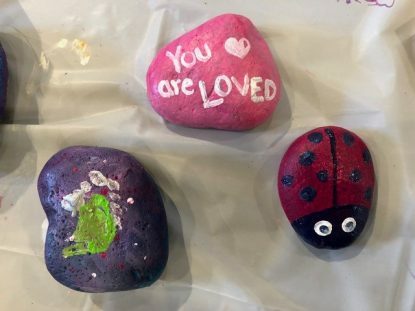 Several Bucks County parishioners recently found themselves between a rock and a “heart” place. 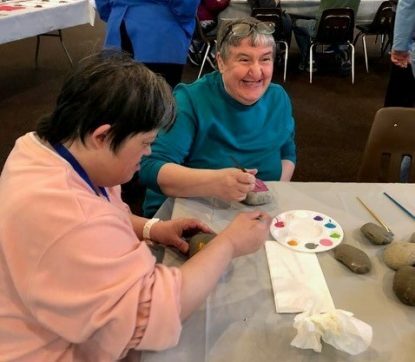 Katie M. (right) works with Rich Ferns of St. Jude Parish in Chalfont on a craft project during an April 21 day of service at Divine Providence Village. 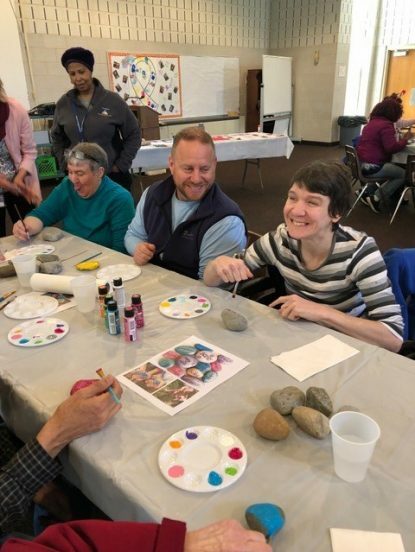 On April 21, more than 10 members of St. Jude Parish in Chalfont traveled to Divine Providence Village in Springfield for a day of fellowship, touring the campus and painting craft stones with colorful messages of hope and encouragement. The visit was coordinated by parishioner Kristen Ferns. As part of the annual Catholic Charities Appeal, the outreach marked the parish’s first visit to the village, which is a fully licensed, intermediate care facility for adults with intellectual, physical and developmental disabilities. Six residential facilities, with a total of 96 beds, are situated on the village’s 20-acre campus, along with an outdoor swimming pool, chapel, recreational pavilion and full-service kitchen. Staff provide round-the-clock professional care and an array of therapeutic services to residents, who were pleased with their visitors’ artistic efforts.